Prescribe Provent Therapy – It’s Treatment that Sticks. Simple and effective, Provent Sleep Apnea Therapy is a clinically proven, FDA cleared, prescription therapy for the treatment of Obstructive Sleep Apnea. Proven over more than 5,000,000 nights, Provent requires no mask or machine and is well tolerated by patients who are unsuccessful with CPAP therapy. Obstructive Sleep Apnea (OSA) is a serious medical condition characterized by pauses in breathing, or shallow breaths, during sleep. Untreated OSA can have a negative impact on quality of life including decreased energy levels, lack of motivation, depression & daytime sleepiness. It may even lead to additional health problems like high blood pressure, heart attack, stroke & diabetes. Provent Therapy is easy to use & maintenance free. It is ideal for nightly use and convenient for travel. 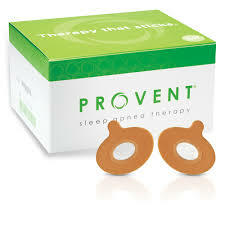 In clinical studies, Provent demonstrated significant improvements across all levels of OSA severity. Small, discreet and disposable Provent is convenient for use nightly at home and while traveling. Provent is the proven CPAP alternative that let’s sleep therapy users unplug with no mask, no tubing and no machine! “Doctors say it has given them a new weapon in the battle against sleep apnea, and many patients who struggled with CPAP call Provent a godsend." Don’t forget we deliver to over 20 towns!